In grammar, there are rules and then there are guidelines. Rules may sometimes be broken, but usually breaking the rules of grammar leads to prose that sounds awkward and is indisputably incorrect. But breaching the guidelines often leads to prose that sounds more natural. An example of a grammar rule would be the use of singular and plural nouns. We do not say I have ten cat or I have one cats. Both sentences are absolutely incorrect. Would this rule ever be broken? Maybe if you’re writing dialogue for a two-year-old. On the other hand, a guideline is a best practice. It’s not a rule; it’s a rule of thumb. An example of a grammatical guideline would be don’t end a sentence with a preposition. In fact, this guideline is commonly mistaken for a rule when in fact, it’s not. There are plenty of sentence constructs where the only sensible thing to do is end a sentence with a preposition. Unfortunately, guidelines are often confused for rules. They are taught in schools and propagated through editors and armchair grammarians. It’s important to understand that grammar, in general, is a form of consensus. When we all agree on how language should be structured, it’s much easier to communicate clearly and effectively. Language is a living, breathing thing, and it evolves over time. 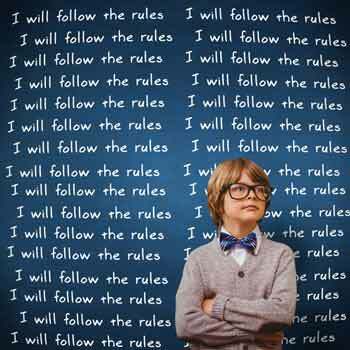 Today’s rules are tomorrow’s guidelines, and in a few years they may fall out of practice altogether. Let’s look at a few guidelines that are widely misunderstood as rules. Warning: Proceed with caution when you flout these guidelines. As mentioned, grammar is a consensus, so there are still a lot of people who believe these are hard-and-fast rules. In fact, some of these guidelines may have once been grammar rules. Split Infinitives: This myth states that you should not split an infinitive with an adverb. An infinitive is a basic form of a verb. If the verb is go, then the infinitive is to go. The guideline against splitting infinitives says that we shouldn’t insert the adverb between the words to and go. We would say “to go boldly” instead of “to boldly go.” But this isn’t a rule at all, so split your infinitives whenever it makes sense to do so. Ending a Sentence with a Preposition: This non-rule, which says you must never end a sentence with a preposition, is one of my pet peeves because when you press a sentence that would naturally end with a preposition into this so-called rule, you end up with something that sounds forced, outdated, and uncomfortable. Consider the following sentence: To which store are you going? While this sentence adheres to the guideline, it sounds pretentious and would feel awkward coming from anyone under the age of two hundred. For prose that sounds natural and normal, use Which store are you going to? Verbing Nouns: This annoys a lot of people, but I think it’s exciting to see new words emerge. A classic example is the use of the verb googling, which is derived from the proper noun, Google. We have to be careful here. If a perfectly suitable verb already exists, there’s really no reason to clutter up the language by creating a second verb with the same meaning. But as new technology emerges, like text messaging, it makes sense that we’ll create verbs like texting. Starting a Sentence with a Conjunction: This can become a bad habit if left unchecked and can result in run-on sentences comprised of multiple clauses linked together by any of the four major conjunctions (and, or, but, and yet). Many sentences simply sound better when they stand alone as opposed to being linked by conjunctions. Consider the following: My friends are going to the football game, and I don’t want to go. This expression actually works better without the conjunction: My friends are going to the football game. I don’t want to go. Oftentimes, starting a sentence with a conjunction adds a punch to the prose: My friends are going to the football game. But I don’t want to go. Using Whom in the Twenty-First Century: Whom is one of those words that has been pushed to near-extinction by the evolution of the English language. Nobody says, “To whom is this letter addressed?” We say, “Who is this letter addressed to?” (Ah, there’s a preposition at the end of that perfectly acceptable sentence!) There was a time when whom had its place in the rule book, but those days are long gone. Unless you want to sound like you just stumbled out of the eighteenth century, you should probably avoid it. Using They for a Generic Singular Pronoun: This is a tough one that is in wide use but still sounds odd to many ears. If we’re talking about a generic person, the old practice was to default to the male singular pronoun. Here’s an example: If a reader likes your book cover, he is more likely to buy your book. We don’t know the actual gender of the generic reader. But using the male default was a biased approach that marginalized females by creating a sense that everybody was male. Many solutions have been offered, ranging from alternating between he and she to coming up with a brand-new, genderless generic pronoun for such cases. However, the most widely adopted practice has been to use they as follows: If a reader likes your book cover, they are more likely to buy your book. Although it sounds odd, it will likely come to sound normal as it’s used more often. Also, I would offer another solution, which would be to simply use plural generic nouns and pronouns whenever possible: If readers like your book cover, they are more likely to buy your book. Problem solved! Final tip: Again, these are still best practices. If you can write a sentence without pinning a preposition to the end, then by all means, follow that guideline. Can you think of any other guidelines that are often presented as hard grammar rules? What about grammar rules and constructs that have faded out of common use? Are there any rules or guidelines that grate on your nerves? Which ones do you break and why? I can think of an old rule, that was hard pressed on me while I was in school (90s), that I am now getting my wrist slapped for in my second round of college: Using a comma for a pause or break in the sentence. Apparently, my middle school and high school teachers were wrong. I have been marked off for this on my college papers with specifics notes about this “rule”. It’s been hard, but I have been working on breaking this habit of 15+ years. Question: Should I no longer care about people using the word “since” when “because” was the appropriate word? I get the feeling they’re interchangeable now, as I have seen it multiple times in my college textbooks! The absence of an Oxford comma is one of my pet peeves too, but that’s a style issue, not a grammar rule (unfortunately). Commas are certainly the most difficult punctuation mark to master, because they are used in so many ways, and there are a lot of variations on style, depending on whether you’re using Chicago or the AP Style Guide. I’m not sure about “since” versus “because.” It would depend on the context. People do use them interchangeably, and there’s not much we can do to stop language from evolving, even when it’s going in undesirable directions (the word irregardless comes to mind as a prime example). Anyway, I’m glad you enjoyed this article. Thanks for sharing your thoughts!